Hangover Monday. And no, not a hangover from alcohol or other toxins, but a hangover from college basketball. Today is the National Championship game, and a good part of the nation – and Vegas – thought the Florida was going to be the outright winner of the NCAA Men’s Basketball Tournament. Alas, the NC game will go on tonight without the Gators – it’s UConn vs. Kentucky (a team the Gators have beaten 3 times already this season). Will I watch tonight’s game? Yeah, I guess. Maybe flip channels between the game and something else that catches my fancy. I definitely won’t be glued to my TV though. Everything seems a little more blah today – even my appetite. Y’know what? It’s one of those ramen type of days. My version of quick ramen soup. 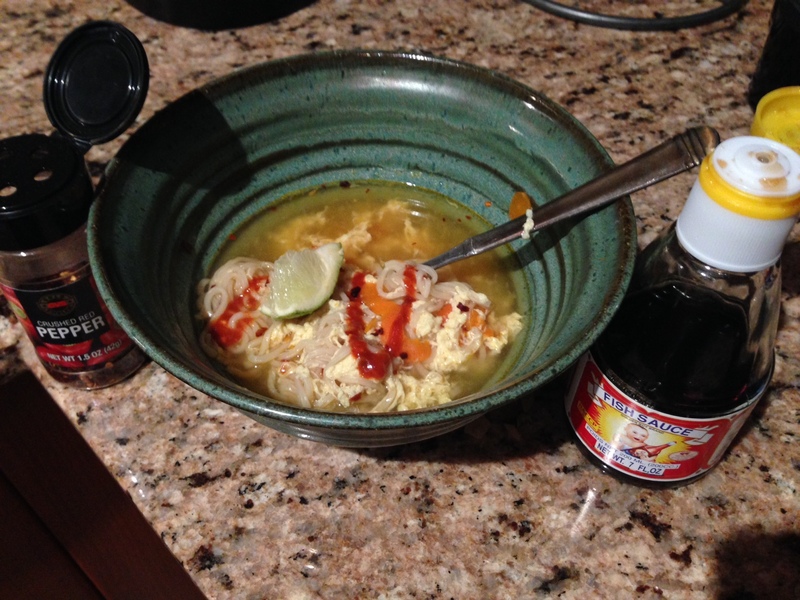 I like to spruce up my ramen a bit – or doctor it up as my girlfriend likes to say. To this shrimp-flavored ramen, I added some fish sauce, red pepper flakes, real shrimp, chopped scallions, celery, carrots, an egg, a squeeze of lime, and sriracha. Okay, I guess it takes me as long to make a full meal as it takes to make ramen the way I like it. So I guess my ramen can qualify as a full meal. 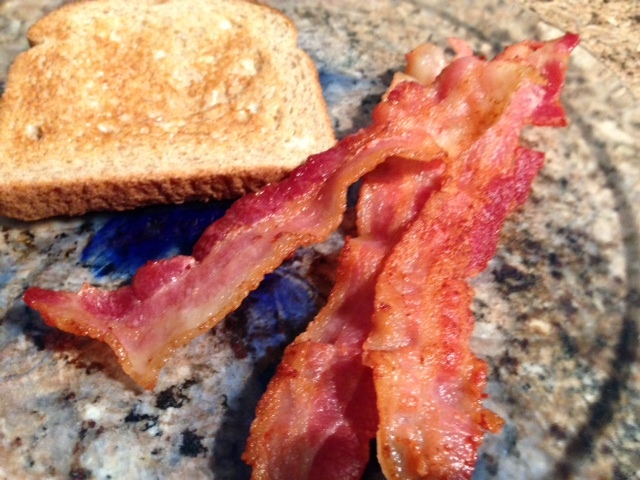 But still no bacon…. Last night, I laid in bed pondering what to give up for Lent this year. Well, actually last night I was on a Bourbon Street-inspired journey along Atlantic Ave celebrating Fat Tuesday by tossing beads and tossing back beers, glasses of wine, and vodka sodas. So, this morning I laid in bed pondering what to give up for Lent this year, and wondering why I had such a terrible headache. I believe whatever you give up for Lent should be something meaningful and something you regularly enjoy – you shouldn’t give up meat if you’re already a vegetarian, or give up stone crab claws because you love them, but in reality you only have them once every year. In previous years, I gave up liquor – but with St. Patty’s Day coming, and March Madness having my beloved Florida Gators destined for a #1 seed, that’s just not going to happen. So I thought, “What else do I love – on a regular basis – that I can give up for 6 weeks and not go crazy and shoot somebody Pistrorius-style?” Then I came upon the most beloved of pork product – that which can be enjoyed for breakfast, or on a burger for lunch, or wrapped around scallops for a scrumptious dinner appetizer, or sprinkled on top of fudge and soft ice cream for a dessert sundae – BACON. When I announced this to my girlfriend Susan, she proceeded to whip up a delicious breakfast featuring some Hormel Black Label bacon, which I gobbled but savored, and headed to church for Ash Wednesday services. Thanks Susan! Hopefully these 3 strips will get me through the next 6 weeks. Hell – will they get me through the next hour of mass? Off to church….